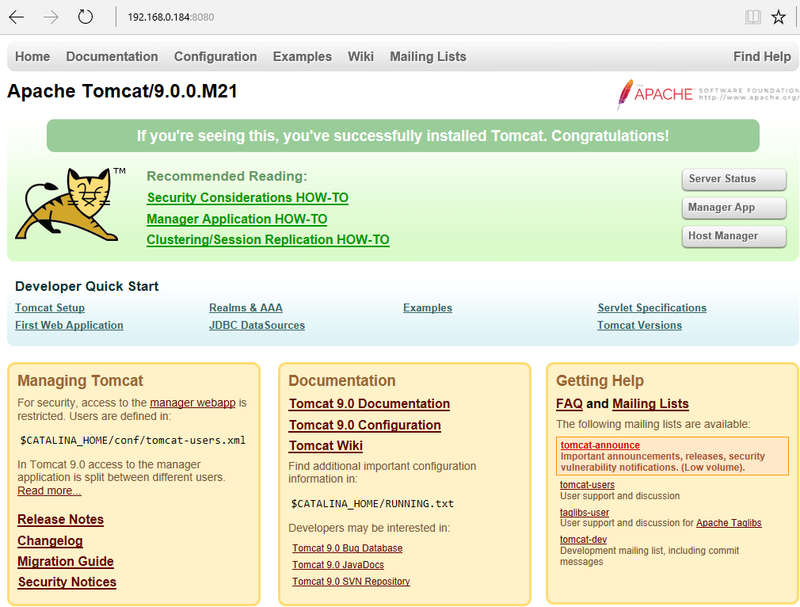 Download Tomcat from https://tomcat.apache.org. If you are using a text-only version of Linux, use wget to download the gzip compressed tar archive. Extract the gzip compressed tar archive. Rename the extracted directory from "apache-tomcat-9.0.0.M26" to "tomcat". If Java Runtime Environment (JRE) is not installed, use apt-get or yum to install JRE. The ps command can be used to verify that Tomcat is running. If the ps command displays two or more processes, where one of the process is Java, this means Tomcat is running. root  18695     1  0  Sep08  ? 00:03:00  /usr/bin/java . . .
On a PC in the same subnet as the web server, navigate to http://localhost:8080. The default page should be displayed. The /opt/tomcat/conf/web.xml file will contain the default documents. In this example, the default documents are index.html, index.htm, and index.jsp. By default, only the index.jsp file will be installed, at /opt/tomcat/webapps/ROOT/index.jsp. Directories can be added to the /opt/tomcat/webapps directory, and then files can be added to the new directory. For example, a directory named testing can be created. Files can then be added to the /opt/tomcat/webapps/testing directory. For example, adding example.jsp with the text Hello there will allow you to navigate to http://localhost:8080/testing/example.jsp and display the Hello there page. If some problem occurs, check the /opt/tomcat/logs/catalina.out file.